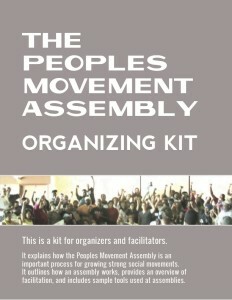 What is a Peoples Movement Assembly? The Southern Movement Assembly (SMA), for example, is a decolonizing theory of systemic social change. The SMA represents the assembly process in building mass movement in the U.S. South. The assembly process allows us to work beyond the boundaries of the organizations, while holding the autonomy, for the good of all. 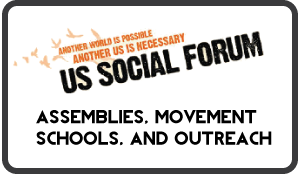 The SMA is a CONVERGENCE of forces, people and organizations, it is an OPEN SPACE for involvement and participation, thus CROSS-POLLINATING the social movements, to think COLLECTIVELY, reach agreement based on SYNTHESIS that then results in ACTIONS that have major impact on the goal of systemic social change. The SMA is multi-cultural, multi-ethnic, multi-racial, multi-gender, multi-national, multi-lingual, multi-regional, multi-generational, and multi-abilities. The SMA is multi-ideological while also creating synthesis for political direction. The SMA creates new knowledge, new analysis collectively and new strategies for effective action and systemic change towards liberation for all oppressed and exploited.